Every now and then, I hear from people who are interested in trying out the REtipster Club membership site – but after they've looked at the sales page and seen the high-level overview of what comes with the package, they still need more clarity on what they'll get if they decide to enroll and become a member. I've always been a little hesitant to hammer my email list and readers with sales promotions for the site, because even though I've put a TON of work into the creation and maintenance of this platform, I don't want to be all about selling you stuff. The only real downside to this approach is – I haven't always made it abundantly clear that this site even exists, and why YOU might want to sign up and become a member at some point… so with this in mind, my goal with this blog post (and video, below) is to give you a transparent look at what this site is all about, and what comes with the package for those who want to give it a try. Now, I realize… it's impossible for me to give a purely unbiased “review” of this site because I own it and I created it. Nevertheless, for what it's worth – I always appreciate seeing an abundance of information on any product or service before I pay for it, and since this kind of comprehensive overview simply isn't out there right now (at the time of this writing, anyway), I'll to do my best to provide a more in-depth look at the site right here. The central purpose of the REtipster Club is to provide a 12-module course on how to get into the land investing business, and how to take your land investing business to the next level. The is a GIANT arsenal of everything I know about how to succeed in this line of work. It contains a comprehensive, step-by-step “playbook” that will take you through the entire process, from start-to-finish. This is the real “meat” of the site. This is a comprehensive course that covers all the basics (and then some) of the land investing business. There are 12 modules, and each module contains anywhere from 3 – 9 lessons within. The course content consists primarily of text, with dozens of videos and audio clips embedded throughout. Some people prefer learning by reading, others prefer learning by video and/or listening – so I've tried to use ALL of these components to explain things in great detail. I've also been continually adding new elements to the course as I'm able to develop new forms of content and offer up solutions to some of the issues that users continually ask for in the forum. If you're familiar with the blog, you probably know that I have several pieces of paid/premium content available through the REtipster Store (if purchased separately, the value is well over $1,000). 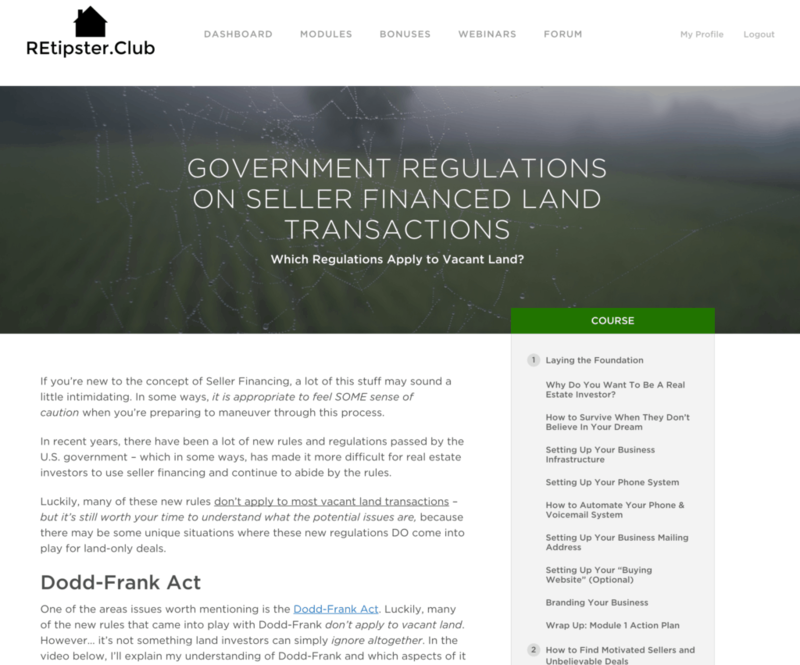 As a member of the site, you will be able to download all of these items for free… so if you want to jump in with both feet, the price of a membership will cover the full cost of all the related material that goes into the land business. Every month, I hold a free webinar for members only. It's a purely unscripted, hour-long session where I'm simply available to answer questions in real-time. There are no sales pitches, and I don't have any pre-planned material to discuss – I'm just available at my desk if you need help. There are usually about a dozen attendees at each session, and each person can either post their questions in the chat box, or we can do a live, face-to-face conversation (similar to a Skype call). It's a great way to get help with your issues and/or gain insights on how to get through issues that your or others might be dealing with. Every so often, I prepare formal webinar presentations for readers of the REtipster Blog. Every webinar I've ever done, (including every Office Hours webinar I've ever held) is recorded – so if you're looking for a HUGE (and growing) library of recorded webinar content to learn from (and/or if you simply aren't able to attend of the webinars you were hoping to see), you'll have access to this growing treasure trove of information and content as long as you're a member. Another interactive resource on the site is the forum. 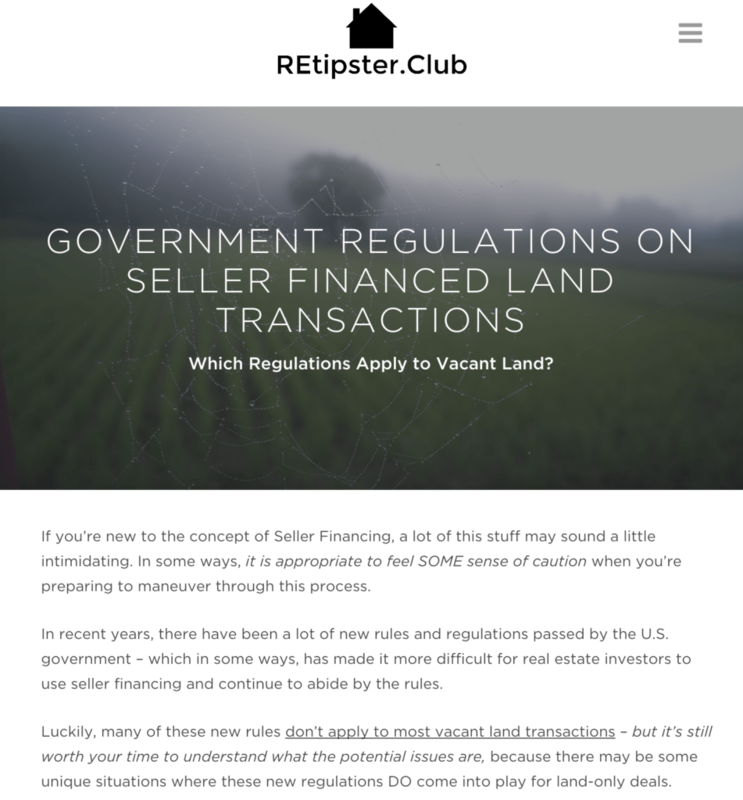 Again, this is a members-only resource where users can post their questions, help others who are going through similar issues and network with other land investors around the country. In the land investing business, this type of forum can be a MAJOR help, because there are a lot of questions and obstacles that are virtually guaranteed to come up in this business, and it's impossible to address every possible situation in the form of a course. When you come across issues like this, there's an active community available to help you. I am also in the forum on a weekly basis (usually multiples times per week), and I do monitor this forum very closely and get involved by directly answering many questions as I have the opportunity to do so. The biggest benefit of this plan is that it doesn't require a massive upfront payment. If you aren’t ready to jump in with both feet, this is the best way to “test the waters” and see what the site is like (however, it's worth noting that the 12 week course is released as “drip content”, so it will take 3 months for the entire course to open up under this plan). If you stick with this plan and continue making payments for the full 12-month timeline, you'll get lifetime access to the site, with no further payments required. The obvious benefit of this plan is that for 3 larger payments, you’ll get access to the entire course immediately. The only delay you'll see is with the bonus modules, all of which will open up 30 days after your membership starts. All in, the price is also a bit less than the Lifetime Plus plan (assuming you plan to stick around and finish all the payments). The benefit of the lifetime plan is that in the end, if you plan on paying for the full lifetime membership, you'll end up paying the least with this option. You'll also get access to EVERYTHING immediately after signing up – so if you hate waiting for things to become available (and if you aren't a fan of making monthly payments), this is probably an option you'll want to consider. Why 3 Different Pricing Plans? I’ll be honest with you – it always kind of bothered me how so many courses are only available with a HUGE upfront investment. On one hand, I do get it. When the information is solid and can literally change the course of your financial future (as it did for me)… it's not asking all that much. For some of us, dropping a couple thousand dollars to get an education worth 100X that amount isn't necessarily a huge sacrifice. Many of us have the money, and we know the knowledge is worth FAR more than the price of admission. On the same coin, I realize that many people simply don't have thousands at their disposal to pay for a good education. I get this too. When I got started, didn't have a lot of cash to work with, and even though I could usually identify a system that would work, I didn't want to burn through all of my startup capital just to learn the basics. If you want the one-on-one coaching or the personal attention a mentor can give you, there are other courses and packages out there that may be a better fit for you. That's okay. I'm not going to tell you that MY course is the only real choice and the perfect fit for everyone. There are other educators out there providing good information too – and if you feel compelled to investigate those options, go for it. My objective isn't to steer you ONLY in my direction. However, if you're looking for the best possible overview for the least amount of money (while still having enough cash to do your first direct mail campaign and buy your first few properties), then I think the REtipster Club is a very, very solid place to start. Why Not a Physical Product? One of the primary benefits of offering this course in an online, cloud-based format (without a printed, hard copy version), is that I can constantly improve and revise this material as the business changes. For the most part, the fundamentals don't change terribly quickly, but they do change and when I hear people telling me what areas they need the most help with, where they're struggling, and where they're getting stuck – an online platform like this allows me to seamlessly offer many of those solutions without selling a new or revised version of the same course. I should also mention that the website is also mobile responsive, so whether you're viewing the course content, forum or webinars from a desktop computer, tablet or phone – it will be easy to read from any device. See what I mean? The content is pretty easy to consume on almost any device. 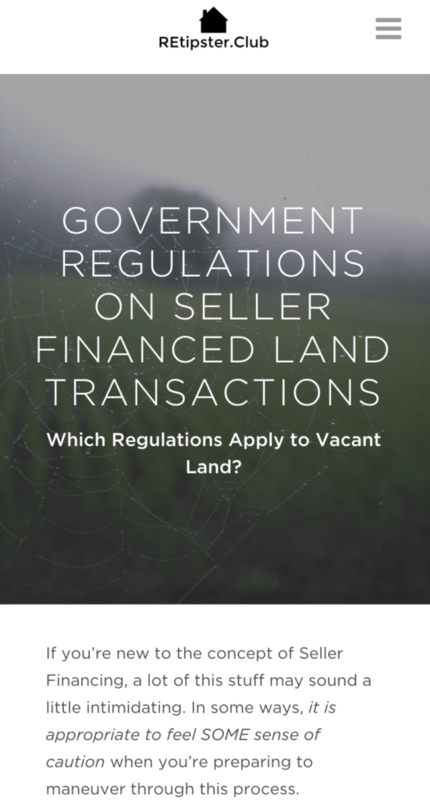 While I certainly don't think it's the only way you can learn and succeed at the land investing business – I have spent a good portion of my life learning the most effective ways (and even some viable alternatives) to make a KILLING at buying and selling raw land. 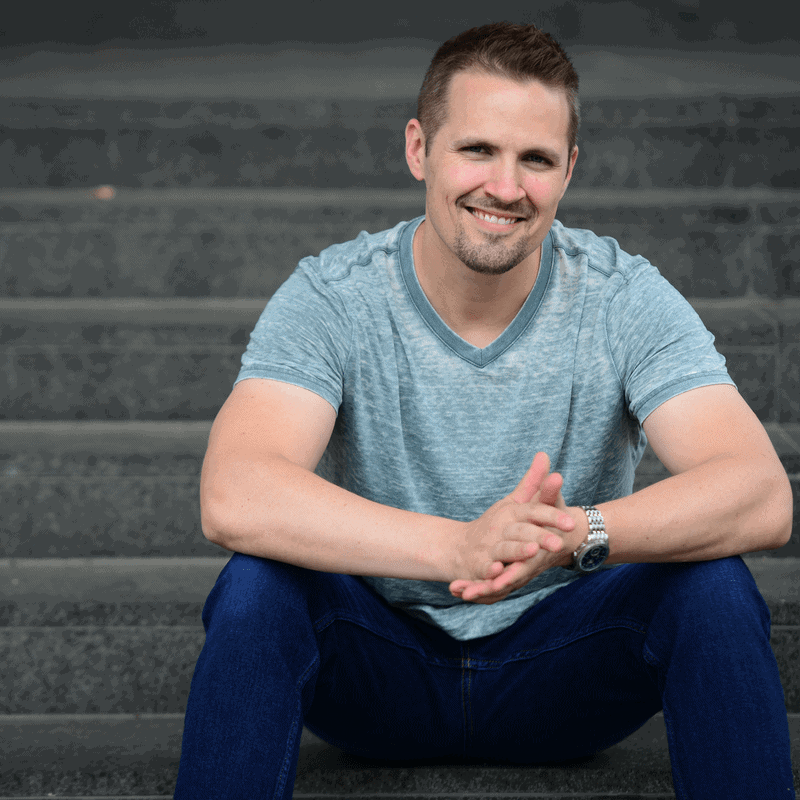 It's a great business, and in many ways – it's one of the simplest real estate investing models I know of… but even so, it's not necessarily the right business for everybody. In the same way, I've seen people experience incredible success in this business (almost entirely on a part-time basis), I've also seen people give up and walk away from it. It happens – because this is a business that takes PLENTY of work, and it's not something anyone should sign up for unless they're ready to do some of the heavy lifting and learning required from the outset. That being said – if you see the logic behind the business model and you think you've got what it takes to make it work (and you probably do, believe me), I'd encourage you to sign up and give it a shot. Jumping into the land investing business could be the best financial decision you ever make. It was for me! I think that your article has been something new ideas. I get lots of information that you share. I learn more information that you published. Thanks for sharing this article. Thanks Seth for sharing informative post. Respect for your new and creative ideas. Hi Seth! I’m looking for land to buy in Arizona to build our own home. Do you think your course would also be good for people looking to buy cheap land for themselves? I’m also interested in buying and selling, but my main focus right now is on buying great land for myself at a discount. Thanks! Hi Kristin! I think it could work for that – the only caveat is that with this approach, the goal isn’t necessarily to find a precise location, but to simply find the best deals with the most built-in equity in a given county… so if you’re planning to use it yourself, you wouldn’t want to get terribly hung up on a specific location, because it’s not really designed for that. If you’re fairly flexible on where you’d like the land to be though (i.e. – anywhere in a given county), then there could be a ton of potential here. I hope that helps! Best of luck to you. I have seen the interviews of people using your system and I understand that this works best for counties that are online. I don’t have the ability to drive (medical) but I am located in the rural Ozarks of Missouri where most of the counties are small and not online. Will this still work for me if I am unable to travel to these locations? Hey Jake! Thanks for your interest. Personally, I would have a hard time working in a county that didn’t have ANY information online (and I know there are a few pockets of the US that are still like this). It would probably be workable IF you were willing to travel to the county office and/or pick up the phone and have a lot of direct conversations with the county… but if you aren’t able to do this, I would think it’d be pretty hard to make it work in those counties specifically. Keep in mind though, while it doesn’t hurt to work in your own backyard (that’s what I did for years as well), it’s not really necessary to confine yourself to such a small geographic area. As long as you’re working in a market where the property data IS online, you should be able to get everything you need without leaving home… so if the areas around home are making it difficult, don’t feel like that’s your only option, because it’s not. Hey Seth. As usual, great job on this post! 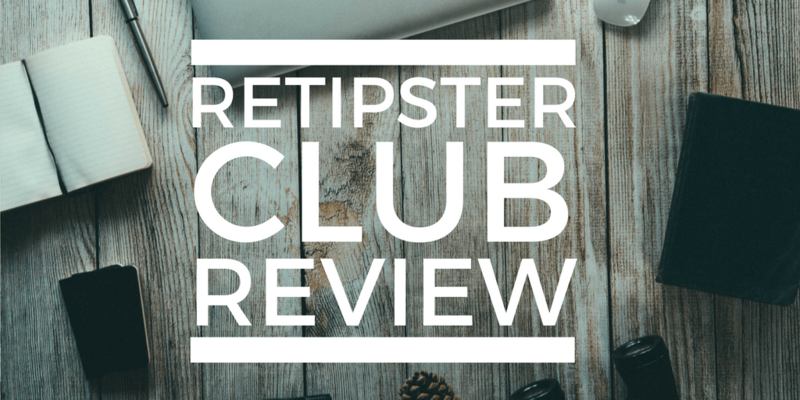 A couple times you mention the REtipster Club contains content that is also available on your REtipster blog. Approximately what percentage of the overall course content is exclusive to REtipster Club? Hi Ryan – at this point, I’d say it’s about half and half. A lot of the downloads in the course (which are free as part of the membership) are actually PAID items on the blog… so they’re available in both places, but you have to pay for each item if you’re getting them from the blog. I hope that helps! If you have any other specific questions, let me know. just a question, is all the content also applicable to investors outside the US? I am European and have several investments going on here, however I am interested in widening my perspective and take part to the US market too. Looking forward to your reply and have a great Christmas time! Hi Andrea – great question! Yep, it’s totally doable, but I would agree on establishing an LLC in the US (it’s possible to do it without this, but the LLC will iron out a lot of wrinkles in the process). I know of one person in Sweden who is actively working his business in the US remotely, and he has been able to make it work, but he would also probably agree on the importance/helpfulness of setting up an US-based LLC. About the Annual payment of $97.00 per month, what is the total amount due, How many months? Hi John – thanks for asking. For the annual plan, it’s a 12 month commitment with the entire annual amount due upfront (so in other words, $1,164 per year). That one payment will give you access to the entire site for a full year. I hope that helps!